Nearly half of Americans think there’s a “deep state” in this country, just more than half think the mainstream media regularly report false stories and six in 10 say the Trump administration regularly makes false claims. Just another day in the world of alleged sneaky stuff. Each of these claims has gained attention since the 2016 campaign and the start of the Trump presidency, and this ABC News/Washington Post poll finds that each has lots of takers. Start with the “deep state,” described here as “military, intelligence and government officials who try to secretly manipulate government policy.” A plurality, 48 percent, think there is such a thing. Fewer, 35 percent, call it a conspiracy theory, with the rest unsure. Whether or not it matters much is another question. 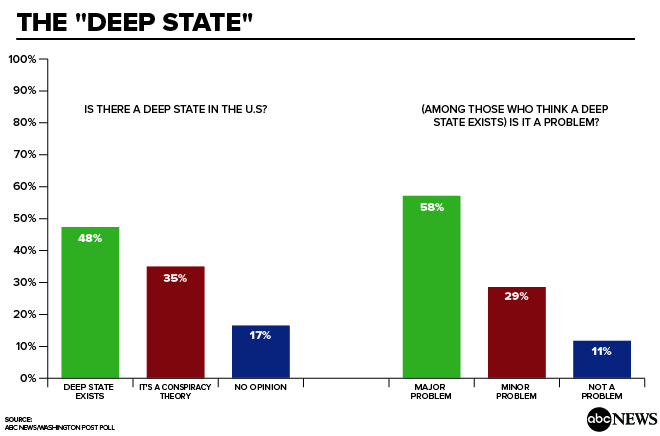 Among those who see a deep state, 58 percent say it’s a major problem for the country –- but that nets out to just 28 percent who both say there’s a deep state and call it a big issue. Then there’s false news and false information. Fifty-two percent think the mainstream news media regularly produce false stories. 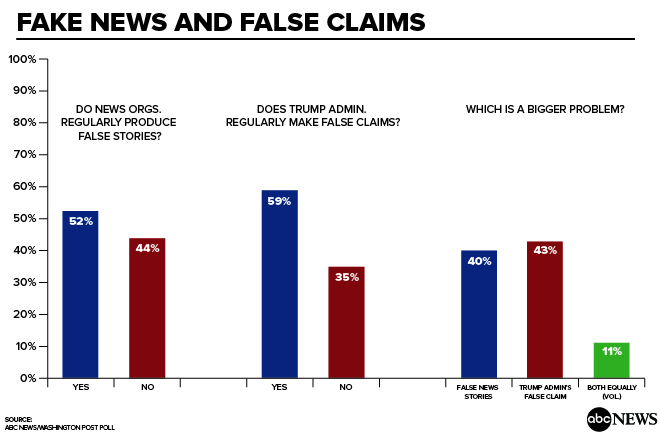 Fifty-nine percent say the Trump administration regularly makes false claims. And which is worse? It’s about an even split, 40-43 percent, respectively. The poll, produced for ABC by Langer Research Associates, finds that views among partisan and ideological groups, interestingly, are quite similar on the existence of a deep state, while vastly different on the question of media vs. administration falsehoods. In a rare show of bipartisan suspicion, 45 percent of Democrats think there’s a deep state at work, as do 46 percent of Republicans. It nips up to 51 percent for independents. Ideologically, the story is similar: Forty-seven percent of liberals, 48 percent of conservatives and 52 percent of moderates see a deep state afoot. The main difference is by age; deep state seers peak at 59 percent among young adults (age 18-29) and drop to 37 percent among seniors. There’s little differentiation elsewhere; percentages in the 40s to 50s across groups see a deep state, with the motivating factor for that opinion not apparent in this survey’s questions. That includes no significant differences by education, often a dividing line on political issues. More customary divisions among political groups rear their heads big time when it comes to false reporting. Sixty-eight percent of Republicans and as many conservatives (peaking at 79 percent of strong conservatives) say mainstream news organizations regularly produce false stories. Just 30 and 32 percent of Democrats and liberals, respectively, agree. On the other hand, 81 percent of Democrats and 87 percent of liberals say the Trump administration regularly makes false claims; a quarter of Republicans and 32 percent of strong conservatives agree. It’s notable that one in four Republicans and one in three strong conservatives ding the administration for false claims, as well. It also does poorly in the middle –- 62 percent of independents and 63 percent of moderates see false claims coming regularly from the White House. These splits carry through to which is the bigger problem: Democrats say it’s falsehoods from the administration, rather than from the media, by 72-16 percent. Republicans say the opposite, by a nearly identical 72-12 percent. Independents are roughly divided. There are other group differences in the results on false information, but almost all are political in nature. Seventy-eight percent of Trump voters and 69 percent of evangelical white Protestants (a core GOP group) think the news media regularly produce false stories; 47 percent of non-evangelical white Protestants and 28 percent of Hillary Clinton voters agree. Flip the tables and 90 percent of Clinton voters, 69 percent of the non-religious, 66 percent of college graduates and 65 percent of 18- to 29-year-olds think the Trump administration regularly makes false claims. Among their counterparts, just 17 percent of Trump voters and 30 percent of evangelical white Protestants agree (as do 56 percent of non-graduates and 50 percent of seniors). On which is the bigger problem, men say media falsehoods by 6 percentage points; women (who are more apt to be Democrats) say Trump falsehoods by an 11-point margin. And there’s a racial and ethnic gulf: whites are more apt, by 12 points, to see false media reports as the bigger problem. Hispanics instead say administration falsehoods are the bigger problem, by a 19-point margin. Blacks do so by a vast 53 points, 70-17 percent. On these, like so many current political issues, what respondents believed depended to a great extent on where they were coming from. This ABC News/Washington Post poll was conducted by landline and cellular telephone April 17-20, 2017, in English and Spanish, among a random national sample of 1,004 adults. Results have a margin of sampling error of 3.5 points, including the design effect. Partisan divisions are 31-24-36 percent, Democrats-Republicans-independents.